Why do I travel? Mostly just because I can’t NOT travel. I really have this unstoppable urge to travel. Life gets in the way all the time – the bank doesn’t take frequent flyer miles as mortgage payments; my seven-year-old likes going to school and the government want him to go pretty often; I have clients (who I love) expecting me to be around reasonably often. But I am constantly thinking about it and forever dreaming of future trips. Every time I go travelling it makes me feel amazing. And my guests in this episode of the podcast feel the same. Travelling is an important part of their lives and it always will be. If you’re the same, you’ll definitely enjoy this episode. 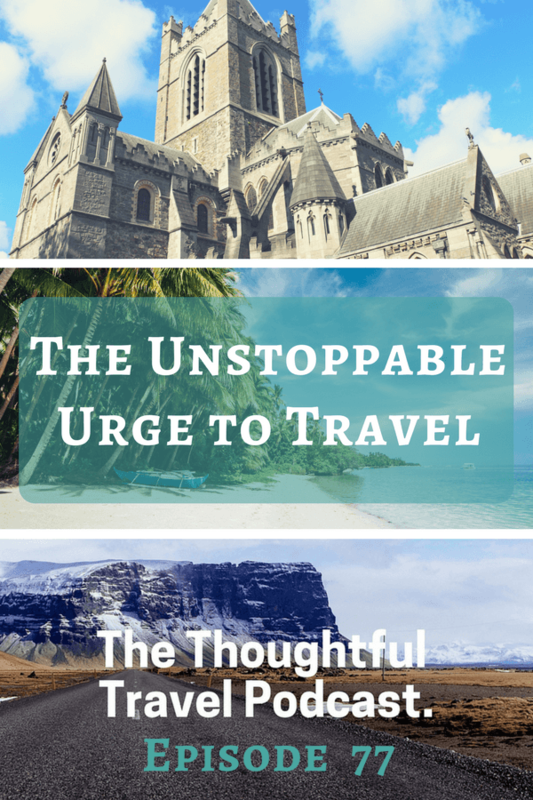 Do you have an unstoppable urge to travel? You are not alone! In Episode 77 of The Thoughtful Travel Podcast, I chat with two fellow travel-lovers who just feel they must travel, as much as possible. To start off with, I chat with Matt Eakin of Himalayan Schoolies, who started his real travelling adventures age 17, with no particular plan other than that he should catch a plane and go somewhere new with the expectation that something amazing would happen. Of course, he was right! With Yasmin Newman, we talk about the influence of our families on our unstoppable urge to travel, and our fervent desire to pass this urge on to our children as well. Yasmin says that travel and her life trajectory are inseparably intertwined and I have to say the same is true of mine.